Do you believe the future is golden? Get the first Goldens Glee t-shirt and show your pawsitivity in style. Plus, a portion of all proceeds will go towards helping train service dogs for disabled children! Glee is a Golden Retriever puppy who calls New York City her home. Her name says it all – she's about inspiring optimism and happiness in all that meet her. Nothing gives her more joy than making her followers smile and encouraging them to see life through her rose colored glasses. She believes the Future is Golden. A portion of all proceeds from this campaign will go to Canines for Disabled Kids, an organization that has helped over 280 families with the cost of training service dogs for disabled children and has provided information on service dog awareness to over 70,000 individuals in schools, business and other community organizations. 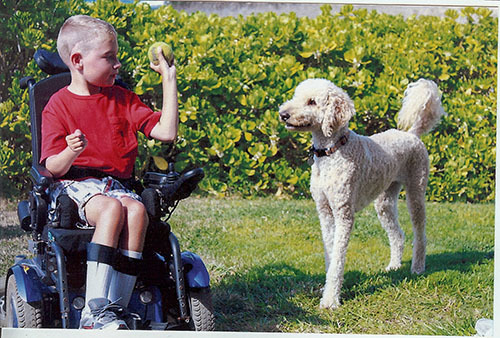 A minimum of $1.00 from every item sold will help train service dogs for disabled children.